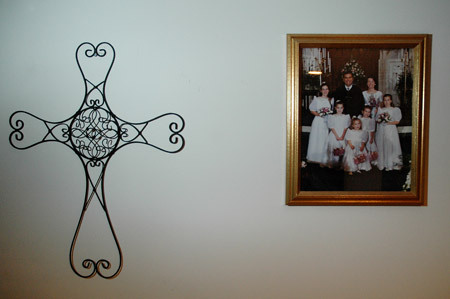 A portrait of the Smock family taken at a friend's wedding hangs next to a cross on their wall. The five daughters now range in age from 10 to 20. They often accompany their parents on campuses when they can afford the time off from their home-schooling. Sabina Alam, right, and Ryan Pruitt, center, follow others downstairs to watch a video on Jed's work at the Smock home in Columbia. Sabina and Ryan said they often watch Jed and Cindy preach on campus and came to the home to learn more about them. The Smocks said they try to bring students to their home at least once a year.